While Flora was growing up, many Highland clans—both Catholic and Protestant—still supported the Jacobite cause. Jacobites favored restoring the Stuart Kings to the English and Scottish throne and believed that parliamentary interference with monarchical succession was illegal. The Stuart King, James II and VII, had been deposed during the Glorious Revolution in 1688, when he was replaced by his daughter Mary and her Protestant husband and first cousin William III. Jacobitism drew much of its primary support from the Scottish Highlands, partially because James had been sympathetic to the Highland clans after several centuries of subterfuge by earlier monarchs. Flora’s family supported the restoration of James and later his grandson, Charles Edward Stuart, also known as Bonnie Prince Charlie. Bonnie Prince Charlie led a Jacobite uprising of French and Scottish troops against the Hanoverians in the Battle of Culloden, Scotland, in 1745. The Jacobites were defeated and the movement went into permanent decline. Following the battle of Culloden, the English vowed to capture and torture anyone involved in the uprising. The MacDonald family urged Flora to help Prince Charles escape to safety. Though the act put her in grave danger, the twenty-four-year-old Flora helped the prince, disguised as her maid, evade pursuers on the Isle of Skye and then escape via ship to France. Once Flora returned home she was arrested and taken to England on a prison ship. On board she was able to charm the crew and the captain, who wrote a letter on her behalf urging leniency in her case. She was allowed to stay in London in a house with her clansman rather than in jail, and she never stood trial for her role in the escape. Flora married Allan MacDonald, also of the clan MacDonald, when she was 28, and together they had seven children. With the failure of Jacobitism, the clan chiefs and gentry increasingly became landlords, and the clan system fell into decline. The 1770s were a time of famine and oppression in Scotland. Flora and Allan immigrated to North Carolina seeking a new life. They were leaving unrest in the Old World and met with more unrest in the New World. When they landed in Wilmington, North Carolina, in 1774, the colony was on the brink of Revolution. Flora was welcomed by the Highland Scots living in North Carolina, and was viewed as a hero by those who knew of her bravery in helping the prince escape. The MacDonald family worshipped at the Barbecue Presbyterian Church, a congregation which still exists today. 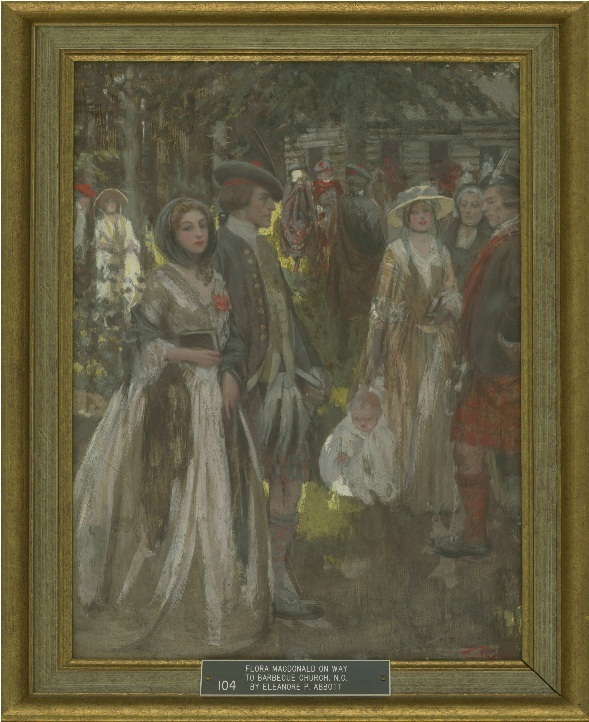 The society’s collection includes a painting of Flora MacDonald on her way to worship at the Barbecue church. Since Allan MacDonald had signed an oath of loyalty to England in order to receive a military commission, the MacDonalds decided to remain loyal to the king when revolution broke out. In 1775, royal governor Josiah Martin tried to raise a small North Carolina Highland regiment to fight the Patriots, and he included Allan MacDonald. In 1776, a small group of Highlanders, along with other Loyalists, departed for the coast to join the British army. According to local legend, Flora made a powerful speech as the troops departed, rallying them to the Loyalist cause. However, the American Patriots defeated the Loyalists, and Allan was imprisoned. Flora and her daughter, Fanny, returned to Scotland in 1779, and Allan joined them in 1784. Flora died at Kingsburgh on the Isle of Skye in 1790, at the age of 68. 14 hours 32 min ago. Today’s #HistoricalFigureFriday honors Reverend James Patriot Wilson. Born in 1769 in Lewes, Delaware Wilson went on to graduate from the University of Pennsylvania in 1788. He initially studied law and was admitted to the Bar but the unexpected death of both his wife and brother led him to a religious path. He was ordained as pastor of the Presbyterian Church in Lewes in 1804 and in 1806 he accepted a call to lead the First Presbyterian Church in Philadelphia. He resigned as a much celebrated pastor in the spring of 1830 before he died December 9th 1830. Our portrait of Reverend Wilson was painted in 1807 by none other than James Peale the younger brother of Charles Willson Peale. This oil on canvas painting represents one of the many large portraits James Peale completed after he shifted away from miniatures. To see more works by James Peale visit PAFA The Pennsylvania Academy of the Fine Arts or the Philadelphia Museum of Art.